water over them so they will not overcook. 4. Stuff the giant pasta shells with the spinach, cream cheese,  and shrimp filling. 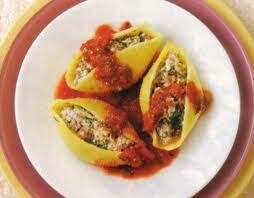 Place the stuffed shells tightly side by side in the baking dish. another 10 minutes until the cheese is bubbly and turning golden. Serve with bread sticks or garlic bread.